1. Where are you located? We are located in the Bennett Infirmary building at 501 Circular Road. 2. Do I have to live on-campus to use University Health Services? No. You do not have to live on campus to use University Health Services. 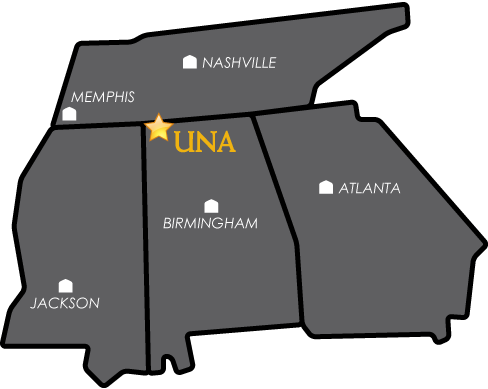 As long as you are a UNA student, you are eligible to use University Health Services. 3. If I only take on-line classes, can I use University Health Services? Yes, you may use University Health Services. However, you must pay the student health fee prior to receiving services. 4. Is it free to be seen for medical care at University Health Services? For students that have paid the student health fee, there is no additional charge to see a provider (physician or nurse practitioner). However, there are minimal charges for medications, procedures, lab work, etc. Employees must pay a $5 visit fee in addition to any other incurred charges during the clinical visit. If you have more specific questions about charges, feel free to ask University Health Services staff. 5. Do you provide on-going treatment for chronic health issues? We do not provide on-going treatment for chronic health issues. Our primary focus is on acute health issues. However, if you are a person with a chronic disease who experiences a health issue that we do treat (see “Available Services” section), we are more than happy to address that particular issue. 6. Do you bill insurance? We do not file for any health insurance. We operate on a fee-for-service basis. We aim to keep our medication and procedure costs very affordable. Oftentimes, the total visit cost at UHS is less than one’s insurance copay amount. 7. Can I get a prescription written for medications so that I can file it on my insurance/my parent’s insurance? Yes. Please ask the provider during your visit to write a prescription versus providing something that UHS stocks. 8. Do you prescribe or provide Adderall or similar drugs? No. 9. I currently see a specialist for a health condition. Do you offer specialty medical services? No. We provide acute medical care. Our recommendation is that if you are currently under the care of a specialist, you remain linked to that provider. If you are relocating, we recommend that you find a local provider (if possible). One way to achieve this is to ask your current provider for a local recommendation. We can also provide you with names of local specialists if you so desire. 10. What do I do if I need care outside of University Health Services hours of operation? If you need after hours care, please visit a local urgent care facility for non-emergencies and a local emergency room for emergencies. You will be responsible for charges associated with care received. Please see the listing below. If you should have an EMERGENCY, go to the Emergency Room or call 911. You will be responsible for charges resulting from services rendered at the hospital. 11. Can my spouse by seen at University Health Services? Spouses, unless they are UNA employees or students, cannot be seen for routine care at University Health Services. However, flu shots are usually extended to dependents (age 18 and older) of employees for a nominal charge. 12. Can retirees be seen at University Health Services? Unfortunately, retirees are not eligible to be seen at University Health Services. 13. Can I get my prescription from another physician filled at University Health Services? University Health Services is not a pharmacy and therefore, cannot fill prescriptions from other physicians. Numerous retail pharmacies are available within the local community that can fill your prescription(s). 14. Why should I seek care at University Health Services over another healthcare provider? UHS would love to meet your healthcare needs and offers many advantages. Located on campus, we offer a convenient healthcare option for students and employees. UHS strives to consistently provide a high quality healthcare experience and is staffed with competent, compassionate employees. We remain an affordable option for insured, uninsured, and underinsured students and employees. Also, according to UNA’s Human Resources, visiting University Health Services results in: little time away from your job, a lower-cost visit (compared to a community provider), and NO insurance claim, so our overall claims experience is not affected.